How To Improve And Master Your Guitar Soloing Now … Right Now! If you want to truly improve your guitar soloing quickly, the first (and last) thing you need to focus on is not 'what you play', but 'how you play it'. If you ask the world's greatest guitar players who 'their' favorite guitar players are, and WHY they like those guitar players, you will not hear things like, "because he plays fast", "because he looks cool", nor "because he can do a lot of different things with his guitar". What you will hear are things like this: "My favorite guitar players have amazing phrasing", or "I love HOW they play" (not 'what' they play). become other people's favorite guitar player. have people love your guitar playing and want to hear more and more and more of it. … then you absolutely MUST focus your practice and guitar playing time on improving your guitar phrasing. Because THAT is the true path to improve and master your guitar soloing… and it's also the fastest way to see the biggest improvement in your guitar playing overall. Yes, of course, other things about guitar playing are important too, but developing great guitar phrasing is the single most important thing you can do to become a great guitar player and musician. You can't name a single 'great' guitar player who wasn't a master of guitar phrasing. Different players may have strengths or weaknesses in other areas, but all great players have mastered phrasing. This is the ONLY universal truth among the greatest players. If improving your guitar phrasing clearly should be your top priority, why are there very few instructional materials on how to improve your guitar phrasing? The vast majority of guitar teachers simply do not have great guitar phrasing themselves. The few that do, find it very hard to teach guitar phrasing to others in an easy-to-understand way… so they teach other things only instead. Most guitar players who don't have great phrasing have a difficult time understanding 'what' they need to do to improve it. The few guitar teachers who attempt to teach phrasing typically say, "play this lick like I do, because the phrasing sounds good". Even if the student is able to play that specific lick exactly as the teacher can, the student still has NOT actually LEARNED anything about how to improve his/her guitar phrasing in general - this means that when the student will play another guitar lick, the phrasing won't be any better because the student only copied the teacher's playing without getting an understanding of 'how' to apply any real phrasing from the first lick to the second one. So what is real learning? What WILL enable you to learn and master guitar phrasing just like ALL of your favorite guitar players have already done? What if you had 2 great guitarists and guitar teachers (Tom Hess - Rhapsody Of Fire & Nick Layton - FireWolfe) show you exactly what you need to do to transform ANY ordinary guitar lick into a killer lick with incredible phrasing? That's exactly what we have done for you. Next, we'll show you exactly how we easily transformed each ordinary guitar lick into incredibly awesome guitar licks. You will see, hear and experience how each lick evolved… and most importantly, we'll explain each version of all 15 licks so that you really learn (not simply copy) how to easily apply these powerful ideas into your own guitar playing so that you can transform any lick into a killer phrase that sounds awesome! Exclusive BONUS - Master Guitar Soloing 'In Action' - Go beyond all the valuable concepts of great phrasing. We've created a great bonus item for you to see the all these concepts 'in action'. In other words, we've put them to use in real life guitar playing for you to see, hear, understand and apply. In this special bonus item, you will receive original phrases and licks from the debut Firewolfe album and hear how they were created using the exact same concepts from the Mastering Guitar Soloing Now course! In other words, you see these concepts 'in action'. Master Guitar Soloing Now is jam packed with killer ideas! Anyone who masters the ideas and concepts explained will be armed with the tools they need to transform their solos into true masterpieces worthy of world class phrasing masters like LaRoque, Schenker, Malmsteen, etc. how I think about playing! This course is going to take my playing to a whole new level and speed up my musical skills by months or even years. Now I won't be running around the fretboard playing boring notes mindlessly - I'll be playing notes and phrases that sound great! 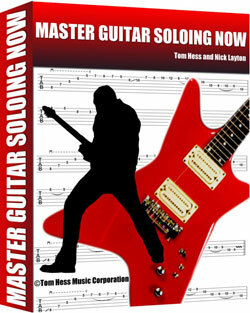 The Master Guitar Soloing Now course is awesome! It has changed the way I view guitar playing by a large amount and answered a lot of questions I had regarding how my favorite players sound so good and my playing doesn't. Now I'll work on being great! You want to hear your own guitar solos and be blown away and think, "WOW! That awesome guitar solo is…. MINE"! Don't miss out on this opportunity. Now we want you to click on orange "Add To Cart" button above, fill out the simple form on the next page and then click on Buy Now button on the following page. One of the great things about the course is that the concepts you learn are universal. You aren't just memorizing some licks that are one-size-fits-all. Instead, you learn fundamental principles that are applicable in any soloing situation, and that's where the real value of this course comes from. This course gives you insight to give each simple note phrase that extra special something that makes your playing stand out and come alive. What really impressed me was that after I finished the course, I realized that I'd become more involved and aware. I can't wait to keep working on my phrasing till I master it. My last final note is this, the course answered a lot of my questions about phrasing and at the same time gave me new questions towards developing my own unique phrasing. Overall, the course is a must have for any developing guitarist.